Cattlemen from the southern tier of the U.S. convincingly endorsed the Town Creek Farm Sale offering on October 19, 2013, in West Point, MS. Town Creek Farm owner, Milton Sundbeck, and his team, warmly welcomed a capacity crowd of customers, friends and family to the Town Creek Farm Bull Sale and Commerical Bred Heifer Sale. 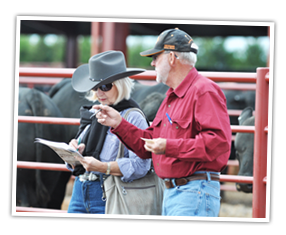 The Town Creek Farm program has quickly established itself as a producer of genetics that excel in real-world commercial ranching operations. Nearly 200 buyers and bidders from 10 states and Paraguay, South America, traveled to appriase the Town Creek Farm offering. When the final gavel tap sounded, 140 Town Creek Farm bulls averaged $4738 and 258 customer-owned commercial bred heifers averaged $2127. The sale grossed $1,218,100. The top selling lot in the bull sale earned a price tag of $12,750. Lot 58, TCF Sleep Easy 223Y, a powerfully made, user friendly bull, had a tremendous amount of admirers who appreciated his performance numbers and his overall completeness. The bull was sired by CCR Sleep Easy 32S7, posted a 76 pound birth weight and a 723 pound weaning weight. Drawdy Brothers of Florida made the final bid on this bull at $12,750. Black River Brangus, Monterey, LA, took home the second high selling bull, TCF Sleep Easy 18Y. One-half interest and one-half possession in the bull sold for $11,500. With a near-ideal phenotype, this bull was powerfully muscled from front to rear, moderately framed, and sound footed. The CCR Sleep Easy 46T3 son is out of a first calf heifer and recorded a 4.19 percent ultrasound marbling score. 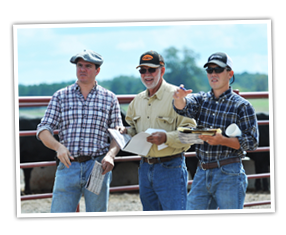 The Town Creek Farm Commercial Bred Heifer Sale was a continuation of the 18-year running Cow Creek Ranch Commercial Bred Heifer Sale held each fall in Aliceville, Alabama. Heifers were sired by Cow Creek Ranch bulls bred back to Cow Creek Ranch and Town Creek Farm bulls. The multi-generational, genetically-tracked heifers commanded strong interest and demand from buyers. When the gavel fell for the final time, 258 heifers sold for an average price of $2127. These customer-owned heifers were offered by Williamson Cattle Co., ranching in Faunsdale, AL, and Okeechobee, FL, and a 16-year consignor to the Cow Creek Ranch Sale; River Oaks Farm, Searcy, AR, 15-year consignor; 14-year consignor, CP Bar Ranch; 9-year consignor, Megehee Cattle Company, Macon, MS; along with five-year consignor, Montgomery Farms, Moulton, AL, and first-year consignor, B&B Farm, Linden, AL. River Oaks Farm and Black River Brangus, Monterey, LA, donated four open heifers which were auctioned off and sold with the proceeds going to the International Junior Brangus Breeders Association. Roger and Vickie Hensley of Arkansas had the winning bid of $1500 per heifer. Volume buyers were from Georgia and Florida.